It's a sweet barbecue taste, not hot — very well balanced. Good crunch, not greasy. There are different levels of barbecue powder depending on the chip, but even those with a lot of powder were still good, not overpowering. Smell test: Not barbecuey at all. They just smell like potato. 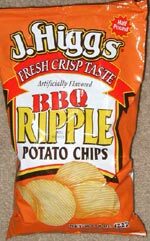 Trivia: The best 79-cent, half-pound bag of barbecue chips we've ever bought. 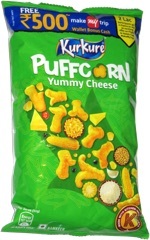 This snack was discovered by Jeremy at Save-A-Lot Food Stores.